Back in the early nineties, the Series 5, along with the more wacky Audio Innovations amps, formed the entry level to valve equipment in the UK. Glenn Croft's designs offered exceptional value for money, with the Series 5 having four EL84s per channel and a fully regulated power supply with a 6080 regulator, giving a clean 25-30W per channel for just £500. Although the Series 5 could never be described as "pretty", it unarguably has a Bauhausian "form follows function" kind of appeal - you might say that it's what a valve amplifier ought to look like, after every gramme of inessential bling has been pared away. My more than twenty-five-year-old pair are from the original generation of industrial black chassis, before Glenn started to care about what his products looked like. It comes with a proper mesh enclosure for the valves, which would probably bring it up to safety regulations, apart from some possible electrical safety concerns1. 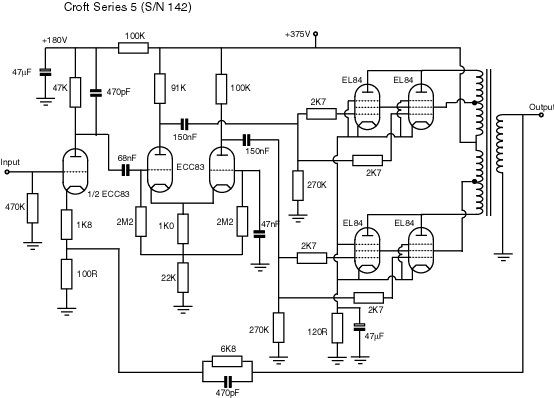 Here is the circuit, with the component values from the first one I bought (SN. 142). 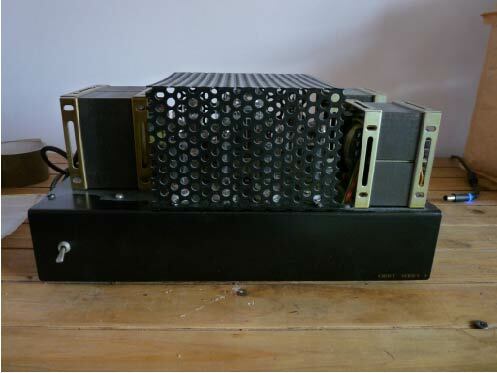 The Series 5 replaced a Quad 306, which was a solidly-designed and good-sounding amplifying brick, and which I was partnering with a Croft Super Micro preamplifier. I'd already heard, and been very impressed by, an Audio Innovations all-valve system. Although I had no particular complaint about the sound of the combination of Croft and Quad - in fact it could sound extremely enjoyable - I couldn't help wondering what an all-Croft system would sound like. In KJ West One the junior Croft power amp, the Series 5, sounded very lush, with an expansive soundstage, and generally very seductive compared with the competent but relatively slightly flat sound from the Quad. The only weak point of the valve amplifier was a slight lack of dynamics at higher volumes, which I guessed that this was a consequence of the largish demonstration room. Reckoning it ought not to be a problem in my living room at home, I made the decision to buy one. Indeed, I was very happy with the sound in my own system. In some ways I am an objectivist in audio matters - any audible difference must be at least in principle measurable, and any amplifier whose output deviates from an exact copy of the input is by definition inaccurate, and I guess the little Quad amp was in most technical senses more "accurate" than the Croft. However, music reproduction at home is above all a matter of personal taste, and for me a system that makes music unsatisfying or uncomfortable to listen to (and I've heard plenty) is unwelcome in my living room. Not that the Quad was unpleasant, I have to say - just that it sounded a little bland next to the Croft. The Series 5 is one of those components that always makes listening a pleasure, having sins mainly of omission. After I'd had my first Series 5 for a couple of years, I decided to buy a second so I could passively bi-amp my speakers. At the time I was using a pair of Shan Shimnas, a clever and original design by a now-defunct company based near Belfast which used a non-rectangular cabinet made of a concrete and resin composite. These were limited in their ultimate performance by the limited power handling and lack of deep bass, as well as by the mediocre drivers, although they were still excellent value for money and sounded remarkably un-boxy. These were, though, quite insensitive at 84dB/1W/1m, and the Crofts were audibly straining at higher volumes. Adding a second was quite a success, as it led to a much more open and effortless sound. After a couple of years I replaced the Shimnas with ProAc Studio Ones, a more conventional, but also more more balanced, design, and this turned out to be a combination I was happy with for several years, and which saw me through several improvements to preamplifier and source components. Soon after I bought the second amp I thought I'd check inside the boxes to see if they were the same - this seemed to be a priority if I was going to use one for each stereo channel. To my surprise, despite the similar serial numbers, I noticed that each amplifier had different values for the the coupling capacitors, though the major hardware such as the transformers seemed to be identical. I took the opportunity at this point to upgrade most of the resistors with precision low-noise (Holco H2 and H8) parts, and made sure that the capacitors in each channel were of the same values. The stock amps came with some cheap-looking RCA input connectors that had no insulation from the chassis. I prefer to have the signal return path to be clearly defined, rather than partly made up of a large steel chassis, so I removed the existing connectors, reamed out the holes by a millimetre or so, and put in some gold-plated sockets with PTFE insulators. These are, incidentally, the same as the ones installed on the phono inputs on my Croft Super Micro A preamp. The one drawback to the Series 5 is its unusually high sensitivity - I estimate at least 30dB. My guess is that this is because Croft preamps tend to have simple cathode follower line stages with unity gain, while many other preamps have a line stage gain of between 10 and 20dB. This is isn't a problem in itself, but used with a preamp with higher gain, and especially one with a linear volume control, the usable portion of the volume control will be pretty limited. Although the amps are quiet as the grave when used with a 10K passive pot, the high gain can led to noise issues with an active preamp - especially a valve preamp. My Vacuum State RTP3 is very quiet in differential mode into my differential 300B power amps, but isn't really compatible with the Crofts, since the combination of the 20dB line stage gain in the RTP3 with a degree of common-mode noise on the outputs gave an intrusive level of hum through the speakers. Here is Ken Kessler's enthusisatic review of the Series 5. 1Safety note: The Series 5 is supplied with a two-core mains lead, and so relies for its safety earth on the connection to the preamplifier. Clearly the amp isn't intended to be used with nothing connected to its inputs, but I'm sure this practice contravenes several electrical regulations. You can get away without an earth wire for a plastic-bodied vacuum cleaner or a table lamp, but an un-earthed steel box with 240V AC, 350C DC and a handful of glass bottles on top does make me nervous. I assume that more recent Croft designs are up to conventional electrical safety standards.